Grab rails are hugely important for any household which is occupied by elderly or disabled individuals. 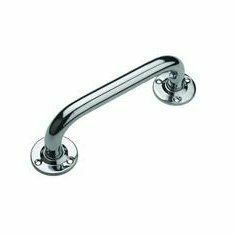 By installing one of our grab rails for sale, you will have a strong and reliable aiding system in place which will make the process of manoeuvring within the bathroom far more efficient. Our designs are suitable for commercial and domestic buildings and come with all the required fixing screws, wall plugs and fixing plates. Another important component for any functional bathroom would be toilet roll holders. Having these in place means toilet roll is easy accessible and will greatly enhance the hygiene within your premises. Quality is assured since our products are made from materials like polished chrome and stainless steel. Towel rails are the best way of keeping any towels neatly stored within your bathroom and ensures they are ready for use after you have finished using a shower or bath. We have single, twin and curved models that all come with a 10-year mechanical warranty. You also need to ensure that towel rings have been put in place for small hand towels. This is especially important since these towels are typically needed to dry people’s hands. Our luxurious models are guaranteed to add vibrancy and style to your bathroom. To keep soap stored in an appropriate manner, you will need to make sure you have installed one of our bathroom soap dishes. We have two modern designs in the form of a satin stainless steel soap dish and a polished chrome tempo triangular soap basket. If you want to keep all of your toothbrushes neatly stored together, you will need to have a toothbrush holder. This will keep your toothbrushes stored in one place and help free up more space around your bathroom. We have a quad toothbrush holder which allows you to place up to four toothbrushes within slots. A further increase of cleanliness can be achieved with toilet brush holders. This will ensure toilet brushes are kept clean and therefore suitable for use. You can choose from either a stainless steel or polished chrome design. Bathroom robes can be kept neat and clean by hanging them onto robe hooks. We have an extensive range of both traditional and modern designs that are guaranteed to withstand a quality and long-lasting life span. We currently have a selection of designs which have been hand crafted by From the Anvil. Bathroom cabinets are the most effective way of keeping any bathroom essentials and equipment neatly stored within one place. This will allow people to organise certain items to make any time spent in the bathroom more efficient. If you need something to store valuable items such as medication, then we have a lockable medicine cabinet which comes with keys supplied. We also have a wide selection of bathroom mirrors currently in stock. Our small pedestal designs are perfect when people are shaving or applying makeup, whereas our larger models will provide broader reflection. Our Apollo mirror with integrated lighting will add innovation to your bathroom since the design will fully light up after you have pulled on a cord. Glass shelves are another stylish and simple method of keeping bathroom essentials neatly stored. Our designs are guaranteed to perfectly blend with the typically bright tones used within bathrooms. They have are part of the Deleau range by Carlisle Brass and can be used for either commercial or domestic establishments. Any showering facility will need to be equipped with the appropriate shower curtain rail. Within our diverse range, we have a selection of bendy models which can be shaped into any size to suit any bath or shower tray. We also have traditional hanging rails with the necessary towel rail ends ready to be attached. You will then have everything in place ready to attach one of our high-quality shower curtains. Our models have been specially manufactured to ensure a long life span as they been made with 100% polyester and use a Proseal coated fabric to greatly enhance water repellency. Finally, we have pull out airers available, to provide clothes with a functional platform as they are being dried. Our designs are suitable for both inside and outdoor balconies and store flat against the wall when not in use.